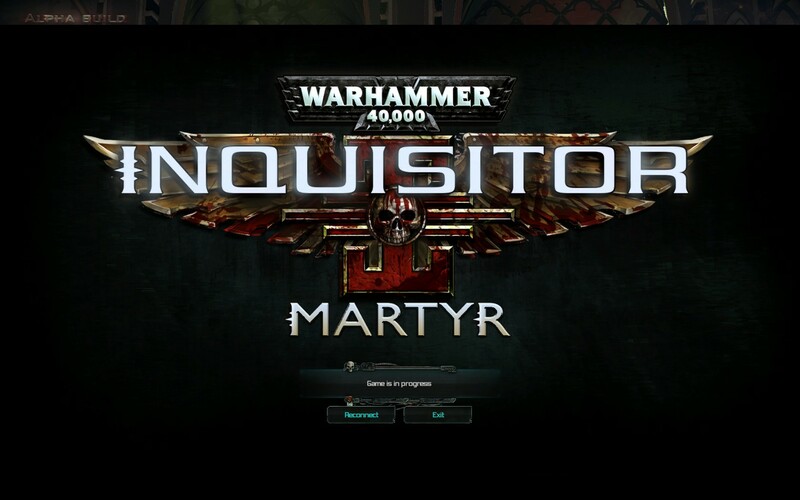 Updates to W40K: Inquisitor - Martyr have been released. The updates will be applied automatically when your Steam client (in on-line mode) is restarted. Please also note that the backend server might take up to 30 minutes to transfer to the newest update, during which time login will not be possible. The Assassin is a fast, versatile class - but only in the hands of highly skilled Inquisitors. She can deal immense amounts of damage under short periods of time, but in return, she has very light armor, making her very susceptible to all forms of damage. Dodge moves: You can swiftly roll in 4 directions to avoid damage, interrupting any current action. The Assassin receives a high defense bonus for a short period of time. Adrenaline: Unlike the Crusader, the Assassin generates her class resource per hit. Stealth Field: Enter a cloaked state, draining Adrenaline with your actions. Attacking breaks Stealth Field and the Assassin receives a 6 second damage bonus, which is halved if the player was detected. Temporal Distortion Field: Slows down all kinetic projectiles, enemy movement and attack speed by 80%. The user's movement speed is increased by 30% for the duration and all attacks are counted as Surprise. Holo Field: Deploys Holograms of the Assassin to deceive enemies. The Holograms will attract and fight enemies but deal no damage. In the next content update, the Assassin will be able to use pistols and two-handed melee weapons. Players can now create Cabals and recruit members to join the fight against heresy! The basics of the Cabal system are now added to the game - Creation, recruitment, and cabal chat. To create a Cabal, select the Cabal button from the bottom menu bar. Creating a Cabal costs 100 Fate. Players can browse for Cabals in the Cabal Browser. New environmental objects: 3 types of destroyable crates and barrels. Reworked existing map settings and monster groups received tweaks to become more intelligent. Imperial Indoors setting: Received new, more open hallway and corridor variants. Reworked existing map settings to give players a better gameplay experience. Current ones are: Hunt, Assassination, Purge, Spoils of War, Daemonic Incursion, and Nurgle Infestation. Hunt now spawns 1 Elite and 2 weaker targets instead of 3 Elites. Spoils of War now spawns enemies when the player is in a chest's proximity. Objective is complete if the monsters are killed within a time period. If a player crosses between two floating skulls, a laser will be activated and enemies will spawn from the beacon. Various new background soundtracks have been added! Replaced every melee skill's VFX and SFX for the Crusader. Added missing VFX for Spawn Beacons. Added SFX for blood splatter. New support wargear is now accessible via loot and from vendors! Storm shields are now craftable and can be purchased from the vendor. The Greataxe is now added to the Crusader's arsenal! Replaced some in-game videos for planets and subsectors. Added videos representing the mission's terrain type for the mission select screen. There is now a message when players want to accept pending rewards with a full inventory. Blocked one-handed weapon combinations where there was no animation for the weapon combo as these weapon combinations were never intended. These included 1H sword + Pistol and Pistol + Shield combinations. We know this feels like a step backwards, but we will definitely re-add these setups when they will receive their unique animation sets and will be balanced properly. Fixed a typo on the Player Info tab. Fixed a typo on the Command Bridge. Fixed a typo on the Friend List. Fixed an issue where daily quests got stuck for some people. Fixed a bug where the camera got stuck after ending a mission in a Turret. Fixed a bug where players stopped gaining Influence. Fixed an exploit where players could gain the final skill of every skill tree. Fixed a crash occurring at the end of missions. Fixed a bug where other items were created instead of the target item. Fixed the crafting bug where players needed to relog to get their crafted items. Displayed mission rewards and Fate are now updating correctly. Fixed a bug where the Guards were not following the player during Investigation missions. Fixed an issue where players got "Game is in progress" error message. Fixed an issue where chat was disabled after a player has reconnected. Fixed a bug where Grenades and the Armor Skill was put on cooldown after switching weapons. Shadows are tilted on the Floating Platform tileset. This will be fixed in a subsequent update. Great job guys, on behalf of Cabal Hydra. Yes, just downloaded...can't wait !!! Cant wait to try it! I am delighted to see this beautiful news! Impassive to play. For all other players from around the world, I invite you to a diplomatic act by loving my project. Besides, if you have other pages representing other country players, send me the information that I participate! Wishing you good times on this inquisitorial adventure. Je suis ravis de voir cette belle actualitÃ© ! Impatient de jouer. Pour tous les autres joueurs du monde entier, je vous invite Ã acte diplomatique en aimant mon projet. D'ailleurs, si vous avez d'autres pages reprÃ©sentants d'autres joueurs de pays, adressez moi les informations que je participe ! En vous souhaitant de bons moments sur cette aventure inquisitrice. So things are not done! I want to request refund. Where should I write? How can I test something I do not normally go? And no matter what patches come out. The problem I have, as was and remains. Huge Kudos to all the Devs for the hard work and dedication to get this patch out to us. Now time to get it downloaded, pray to the Emperor i can see in game chat again, and purge the tainted and ruined in thy name whilst screaming "Excommunicate Traitoris"
for me is it actually frustrating, but will try tomorow...and maybe i dont play only right - dunno. Please keep in mind that the game is still in alpha state. So there is always a chance when a patch comes out that something is not going to work as expected. We are working very hard to fix these things as soon as possible. 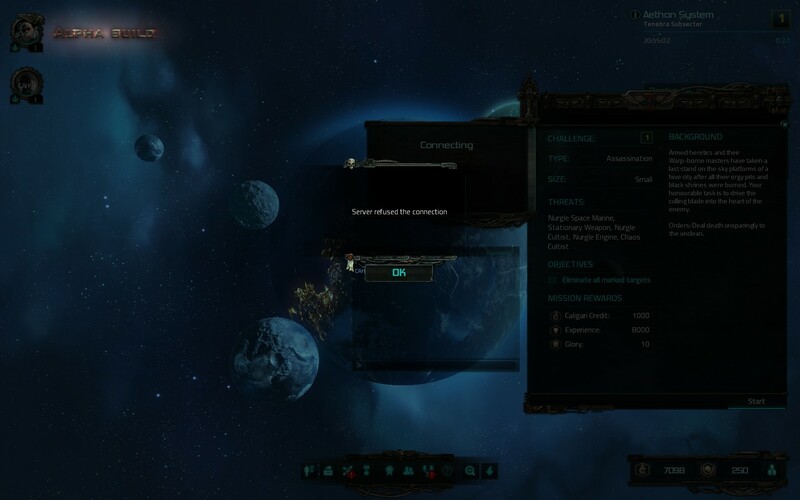 After the patch, players reported that the CO-OP is not working as it should be. So please, be patient as long as we fix the problem. you might want to make this sort of issue in a separate post. This isn't really the place to be reporting bugs, complaining or requesting refunds. Are the missions suppose the spawn infinitiv ammound of enemys comming in waves at random times now? Also is there a way to revert to the last patch? I could play whit coop my friend. The enemys dident cliped through walls or shot through them. There was not spawing an insane ammount of enemys there will ran straidt to you when maps start(or shoot at first bad buy). The difficulty was more fun. Do we need to purge the Dev's offices because the heretics have returned? Did the fires need to be stoked because of inclement weather? Do the Dev's feel that they are now under the Emperor's personal guidance and, will have a restful weekend? How many Dev's are going to 'throw a sickie' on Monday morning? I'm digging it so far! Definitely feels a lot more polished and responsive than before. Thanks for another patch! Finally play for the long-awaited new class :) No doubt that your team is responsible! Go ahead and continue to create this awesome game! Good luck, look forward to new updates. Top work yet again, kudos to the Neocore team, loving the Assassin class and her variety of rifles and hand to hand weaponry. Here I was woken at 2am (my local time) by 2 of my young kids (2 1/2 yo and 3 week old), after feeding them both and getting them back to bed while my wife slept through the entire ordeal I might add, I was wide awake and it was 3am, bored I jumped on the computer and you beauty! the update had arrived. A nice strong 1L thermos of espresso coffee was made and I got into my comfort zone. Needless to say I have now enjoyed many hours (so far just over 200 for the alpha) purging with now 2 of the awesome classes made playable, and it makes me look forward to the upcoming Psyker class even more. As always keep up the fantastic work, Guys and Girls of Neocore. The co op has never been working, whys this anything new? Great stuff so far....Now I'd like to see an optimization patch alongside with a fix for co-op. Fixing co-op and optimizing the game should be a priority. Content can come eventually. Priorities should be established. New background - Assassin looks good, but patch in general has a lot of issues. New map setting has targeting, pathfinding, shadows and camera issues. I created an Assassin character with sniper background and the very first mission I play is on a new tileset. Sadly Sniper can't shine there at all. Sniper rifle's range is exact same as your average Autogun. To do a headshot you need to move in enemy alert zone and wait 3 seconds while sustaining heavy fire - ridiculous. On floating platforms tileset enemies constantly shift between targetable and untargetable state as they move around. Also at least on this tile set she can't roll in all 4 directions, only in 1. So where is the game going to look like in the video, with corridors being dark and only illuminated by our lights and skills? Got to be honest not finding much to enjoy in this new update. Gameplay is forced at either far edge of screen for ranged or swarmed, there is no movement or tactile elements here, nor is there any use of a medium range engagement. Find myself fighting at range having to shoot the feet of enemies at the top of the screen, also keep finding there is again no point to cover in range combat as the enemies are outside of the stupid range indicators all the time forcing you to Agro or rush head first in then run back to said cover and wait ..
Start a new character and play a level 1 mission is luck of the draw if you are able to finish or not, example first mission on new sniper class put in a room with 4 havocs and a dread GG , forcing me to kite for 43 minutes to complete â not fun in the slightest. The good points, music is better, new grav gun visuals are nice ! Keep at it guys love the game overall but have to be honest with feedback and I guess I was just hoping for the core game-play to feel a tad more polished and responsive with the update but with performance going down by an average of 37% on my system ( i7 4770k at 4.5Ghz, 32GB ram, GTX1080) the game feels slower and more clunky than ever. Awesome content patch, first of. 1. The new boxes... Do they have to be EVERYWHERE? I mean, they are nice, and I like being able to destroy a fair amount of the scenery, but does every map need to look like the inside of a warehouse? 2. The enemies have gotten a bit of a boost in power, but they also seem to have been bunched together a lot. I have noticed several places where they patrol, which is something I requested after last patch (thank you). But HUGE mobs of enemies, not so much. 3. The mouse wheel. Please give us an alternative. A different button to press while moving the mouse, the "A" and "D" keys.... anything but the wheel. 4. Love the look of the new assassin class. Not my favorite to play, but that's just my taste. Still waiting for character customization. I know it's coming, I'm patient. 6. I got a friend request once I joined a cabal. I had the options of either choosing a green check mark with the message to refuse the request, or a red "x" with the message to invite this person to my group. First of all, the texts are mixed up, second, I don't want to have to invite someone into my group just to accept a friend request. 7. The new maps, the "platform in the sky" stile, is awesome!!! I love it. So much detail to be seen below the level you walk on. A feast for the eyes. Upwards sloping platforms are a nightmare for the current camera options, though. Keep up the good work. I for one am looking forward to the next patch. Already submitted a bug report but I'm 50/50 with game freezes. Very frustrating as first 5 games were smooth, last 5 froze for no reason. 1. The camera angle when fighting enemies on the sloping platforms in the new map is problematic because it makes it impossible to target them. Love the new map through..
2.Yes, the enemies have gotten harder but I'm ok with it. Just means gotta take it a little slower. 3. Getting and shooting behind cover is an issue. When shooting from cover I just end up automatically moving away from it when targeting an enemy making the whole exercise pointless. Other words, pathfinding is an issue in regards to cover. 4. I know it's alpha but I'm very impressed with the chaos space marines models as well as my character, very well done with nice detail, esp the chaos sorcerers. Love the new armor and weapon models as well. 5. The new boxes are good looking.. but there's a little too many of them. 6. Optimization is an issue, I know it's alpha, but it is an issue atm. Overall I like what's going on here. The game looks terrific in some areas and I think u guys are on the right track. There are a few things i'd like to see at some point through; armor sets, cut the crafting time down( 10 mins.. really!) Gray Knight space marines as a follower as they are the chamber militant of the Ordo Malleus so they should be at our disposal. Yes it was. I played co-op all the time. It didn't work 100% of the time, but at least 85% of the time it did. Outdoor maps and certain missions seemed to fail more often than others, but it was mostly working for me. I know you have your priorities, but my 2 cents - 40K is somehow related to pistol/melee for me. It is so prevalent in all of the 40k art, including the board models. I think you should add them when the animations are there, not when they are also balanced. They never will be until people play enough and give you feedback..
if you cannot do any mission, try to look at star map - are you in level 2 maps, where you ended last time ? Hello. Please update version in mantis. you really need a pass on optimisation the more corpse on the map the heavier the lag is. I crash for unknown reason at the beginning of a mission or when i go back in the fortress. most of the animation are all over the place on my rig. Overall a great step forward, good work, although far from perfect or complete. People, please remember to keep in mind that we are still just testing in Alpha here...be patient. The Emperor protects ! My own two cents here...the music is "better", but not quite right. Needs to be darker and more moody. Thanks for the notes guys, we will be on this first thing on Monday. Nice patch, hope you guys have a plan to add the posibility to remove items from you character since right now you can only replace items not unequipt them. i had a crash last night playing my assassin, when i entered the game again a message told me... please accept your pending rewards! you can't start a new game until this! when i press the pending reward marker, im told i have a crafting result, but cant collect anything, i press claim and nothing happens, i tried making a new assassin, no pending rewards there, i tried crafting and item, same effect as the other assassin. i also insta craft assassins. Hello Rashadee, u have the game files from steam? Right click on ur game in the library and check ur files for missing files. Hello Blasron, the M680 is fast but 2gb is for an Alpha with a lot of bugs a bad decision. So im always sure that the System is stable and the tested program/game have a Problem. i tried the ''verify integrity of game files'' option in steam, i also tried to uninstall, and then reinstalling the game. i miss Pistol and Sword to.. Still having issues with loading the game. For some reason, I get a flash of what looks like it could be a load screen, then nothing. Please help, or at least explain to me what is happening. Thanks for all the work thus far. Please use English when posting on the community hub as a courtesy to other players. Members of the community who refuse to accept this rule might get warnings from the moderators, who will remove the debated posts. Deliberately and/or continuously ignoring this rule might lead to ban.